The KitchenAid Diamond Blender, with exclusive diamond blending system, provides the ultimate blending performance to stir, chop, mix, puree and liquify, with pulse 1-5 settings and crush ice mode. A robust motor, unique one-piece, BPA-Free diamond pitcher, stainless steel blades and electronic controls combine to create a powerful vortex that is fast and thorough for exceptional blending results.Additionally, Intelli-Speed Motor Control senses contents and maintains optimalspeed to power through all ingredients.Diamond Blending SystemThe diamond blending system ensures that all ingredients blend together quickly and efficiently. A robust motor, unique one-piece, BPA-Free diamond pitcher, stainless steel blades and electronic controls combine to create a powerful vortex that is fast and thorough for exceptional blending results.Intelli-Speed Motor ControlThe Intelli-Speed Motor Control senses contents and maintains optimal speed to power through all ingredients.5 Speeds/Crush Ice/Pulse ModeStir, chop, mix, puree or liquify. Pulse mode works with all speeds for staggered blending, while the crush ice feature pulses at precise intervals for optimal icecrushing results. With the exclusive Diamond Blending System found only in the KitchenAid Diamond Blender, blend everything imaginable with ease and efficiency. The patented stainless-steel blades and diamond-shaped pitcher create a powerful vortex to deliver the ultimate blending performance. With a range of intuitive functions, like Intelli-Speed motor control that automatically adjusts for optimal speed and power, make soups, smoothies, sauces, and salad dressings. When your blender is this versatile, there’s so much more to make. Creates a powerful vortex for fast and thorough blending. Go beyond industrial strength to provide sharp precision cutting. Turns ice cubes to snow instantly. 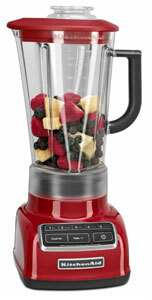 60-ounce blender with Intelli-Speed motor that auto adjusts for optimal speed and power. 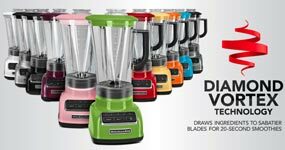 Diamond Vortex technology draws ingredients to sabatier blades for 20-second smoothies.